Abstract: The Qisir Dagh igneous complex occurs as a combination of volcanic and intrusive rocks to the south-east of the Sabalan volcano, north-western Iran. Micromonzogabbroic rocks in the region consist of plagioclase, alkaline feldspar and clinopyroxene as the major mineral phases and orthopyroxene, olivine, apatite and opaque minerals as the accessory minerals. Microgranular and microporphyritic textures are well developed in these rocks. Considering the importance of plagioclase in reconstructing magma cooling processes, the size and shape distribution and chemical composition of this mineral were investigated. Based on microscopic studies, it is shown that the 2-dimensional size average of plagioclase in the micromonzogabbros is 538 micrometers and its 3-dimensional shape varies between tabular to prolate. Crystal size distribution diagrams point to the presence of at least two populations of plagioclase, indicating the occurrence of magma mixing and/or fractional crystallization during magma cooling. The chemical composition of plagioclase shows a wide variation in abundances of Anorthite-Albite-Orthoclase (An = 0.31—64.58, Ab = 29.26—72.13, Or = 0.9—66.97), suggesting a complex process during the crystal growth. This is also supported by the formation of antiperthite lamellae, which formed as the result of alkali feldspar exsolution in plagioclase. The calculated residence time of magma in Qisir Dagh, based on 3D crystal size distribution data, and using growth rate G = 10—10 mm/s, varies between 457 and 685 years, which indicates a shallow depth (near surface) magma crystallization and subvolcanic nature of the studied samples. Abstract: The Julian Alps (western Slovenia) structurally belong to the eastern Southern Alps. The Upper Triassic succession mostly consists of shallow water platform carbonates of the Dolomia Principale-Dachstein Limestone sys- tem and a deep water succession of the Slovenian Basin outcropping in the southern foothills of the Julian Alps. In addition to the Slovenian Basin, a few other intraplatform basins were present, but they remain poorly researched and virtually ignored in the existing paleogeographic reconstructions of the eastern Southern Alps. Herein, we describe a deepening-upward succession from the Tamar Valley (north-western Slovenia), belonging to the Upper Triassic Tarvisio Basin. The lower, Julian-Tuvalian part of the section comprises peritidal to shallow subtidal carbonates (Conzen Dolo- mite and Portella Dolomite), and an intermediate carbonate-siliciclastic unit, reflecting increased terrigenous input and storm-influenced deposition (Julian-lowermost Tuvalian shallow-water marlstone and marly limestone of the Tor For- mation). Above the drowning unconformity at the top of the Portella Dolomite, Tuvalian well-bedded dolomite with claystone intercalations follows (Carnitza Formation). The latter gradually passes into the uppermost Tuvalian—lower- most Rhaetian bedded dolomite with chert and slump breccias, deposited on a slope and/or at the toe-of-slope (Bača Dolomite). Finally, basinal thin-bedded bituminous limestone and marlstone of Rhaetian age follow (Frauenkogel For- mation). The upper part of the Frauenkogel Formation contains meter-scale platform-derived limestone blocks, which are signs of platform progradation. The Tarvisio Basin may have extended as far as the present Santo Stefano di Cadore area, representing a notable paleogeographic unit at the western Neotethys margin. 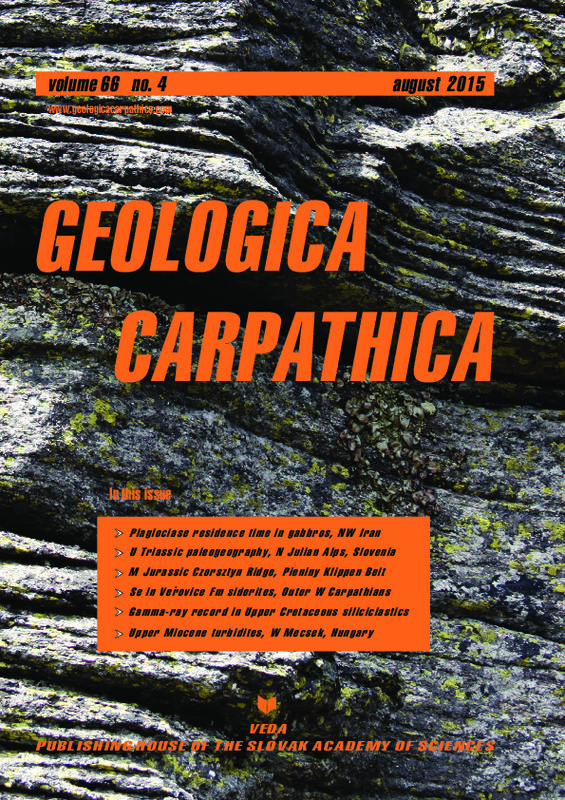 Abstract: In this study, we revisit the stratigraphic age and discuss sedimentary characteristics of the lower Middle Jurassic turbidite deposits (“black flysch”) of the Szlachtowa Formation, as well as the under- and overlying members of the Sprzycne Creek section situated in the central sector of the Pieniny Klippen Belt (Poland). We show that the succession captures the lower Middle Jurassic marine sediments of the pre-Late Albian Magura Basin, located to the north of an ancient submarine swell (Czorsztyn Ridge). The turbidite deposits of the Szlachtowa Formation and marly shales of the Opaleniec Formation yield dinoflagellate cysts indicative of the latest Aalenian or learliest Bajocian to Early Bathonian. The character of these deposits, and their location below the overthrusted Subpieniny Nappe show that this succession does not belong to the successions of the Oravicum domain, located on the southern side of the Czorsztyn Ridge. The Szlachtowa Formation is underlain by the Skrzypny Formation, which is reported for the first time outside the Oravicum domain. It suggests that the pre-Late Albian Magura Basin came into existence not earlier than during the latest Aalenian, following the rising of the Czorsztyn Ridge. The marly shales assigned here to the Opaleniec Formation of Late Bajocian-Bathonian age and younger marly deposits of Cretaceous age were distinguished in the past as the so-called “Sprzycne beds” of Cretaceous age. However, the combination of these two rock units into a single lithostratigraphic unit is unsuitable because they represent two separated stratigraphical intervals and their contact is tectonic. Abstract: Microparticles of native selenium were detected in weathered sideritic mudstones of the Veřovice Formation (Aptian) of the Silesian Unit (Outer Western Carpatians, NE part of the Czech Republic). This mineral forms small needle-like crystals with lengths of up to 20 µm, and is confined to fissures in sideritic mudstones covered by goethite or rarely also by hydrated Mn-oxide minerals. The oxidized sideritic mudstones show zonal structure and resemble the initial stage of the formation of the so-called rattle stones. From the superposition of phase diagrams of selenium and Fe-oxyhydroxides, Fe apparently occupies a large field in which Se(0) and FeOOH and/or Fe(OH)3 can co-exist. The reduction of selenites or selenates by pyrite or by any other phase, capable of charge transfer, is likely to have been responsible for the formation of microparticles of native selenium. The crucial factor controlling the origin of these particles is the extremely low solubility of Se(0). The source of Se is not obvious. It can be released in trace concentra- tions during the weathering of pyrite. Sediments of the Veřovice Formation correspond to the anoxic event OAE1b and accumulation of siderophile elements in similar sediments is very probable. A probable mechanism for the origin of Se microcrystals is gradual crystallization from solution. Abstract: The relationship between contents of clay minerals/grain size and spectral γ-ray record (concentrations of K, U and Th) in sediments is used for interpretation of sedimentary facies in wire-line logs. However, this approach is often complicated by the multi-component nature of mineralogically immature siliciclastics. As mineralogy of the source mate- rial and grain-size sorting during transport both contribute to the detrital composition of the final sediment, a joint study of facies and outcrop γ-ray spectra can potentially make the latter an effective tool in provenance studies. This paper provides comparison of outcrop γ-ray data and detailed facies mapping with mineral and chemical composition of the rocks (modal composition; transparent heavy mineral assemblages; WDX SEM chemistry of minerals) and interprets them in terms of provenance changes. We studied the Upper Cretaceous, synorogenic siliciclastic sediments of the Mazák and Godula Formations (Silesian Unit of the Western Carpathians flysch belt). Decreasing mineral maturity of the studied sandstones is consistent with provenance change from craton interior – (Mazák Formation) to transitional continental and recycled orogen sources (Godula Formation). Two major phases of K, U and Th concentration shifts, which occurred close to the Mazák/Godula Formation and Middle/Upper Godula Members boundaries, are consistent with changes in main detrital modes. These trends indicate gradually accelerated influx of material derived from high-grade metamorphic and plutonic rocks during deposition of the Mazák and Godula Formations. These changes are interpreted as reflecting a gradual exhu- mation and erosion of deeper crustal levels of the source area, the Silesian ridge. Abstract: The floor of Lake Pannon covering the Pannonian Basin in the Late Miocene had considerable relief, including both deep sub-basins, like the Drava Basin, and basement highs, like the Mecsek Mts, in close proximity. The several km thick lacustrine succession in the Drava Basin includes profundal marls, basin-center turbidites, overlain by shales of basin-margin slopes, coarsening-upward deltaic successions and alluvial deposits. Along the margin of the Mecsek Mts locally derived shoreface sands and deltaic deposits from further away have been mapped so far on the surface. Recent field studies at the transition between the two areas revealed a succession that does not fit into either of these environments. A series of sandstone a few meters thick occurs above laminated to bioturbated clayey siltstone. The sandstone show normal grading, plane lamination, flat erosional surfaces, soft-sediment deformations (load and water-escape structures) and sharp-based beds with small reverse faults and folds. These indicate rapid deposition from turbidity currents and their deformation as slumps on an inclined surface. These beds are far too thick and may reveal much larger volumes of mass wasting than is expected on the 20—30 m high delta slopes; however, regional seismic lines also exclude outcropping of deep-basin turbidites. We suggest that slopes with transitional size (less than 100 m high) may have developed on the flank of the Mecsek as a consequence of lake-level rise. Although these slopes were smaller than the usually several hundred meter high clinoforms in the deep basins, they could still provide large enough inertia for gravity flows. This interpretation is supported by the occurrence of sublittoral mollusc assemblages in the vicinity, indicating several tens of meters of water depth. Fossils suggest that sedimentation in this area started about 8 Ma ago.